It’s hard to believe its been four years since Cephas & Wiggins released their last record, the highly acclaimed, Somebody Told The Truth, on Alligator. Like a fine wine that needed time to age, the cuts on their new record, Shoulder to Shoulder (Alligator Records), reflect the wisdom and maturity these purveyors of the Piedmont style of blues have been known for. It’s a record that continues to shine on the amazing guitar talents of John Cephas and the harmonica stylings of Phil Wiggins while furthering our appreciation for a style of blues seldom heard anymore. Opening with a Cephas original, "Ain’t Seen My Baby," we find John looking everywhere for the woman he loves. She’s built the way he likes her, with big legs, long curly hair and heart to match, but she’s nowhere to be found. The piano of Ann Rabson provides an endearing backing to "I Did Do Right." According to John, “the best thing I ever did in my life was when I did do got rid of you.” The girl in question was stepping out on him and the smart thing to do was to show her the door. I particularly like Phil’s harp fills complementing Ann’s keyboard work. This is just a wonderfully well-done song by all. "All I’ve Got Is Them Blues" is every man’s anthem. Love’s gone wrong, misery finds you in the midst of a deep funk….and all you’re hoping for is: “send me a woman…a woman to love.” Whether or not love will cure the blues is open for debate but at least it’s a step in the right direction. “Well I’m going away…..where I don’t know” are the opening words to John and Phil’s adaptation of the Charley Patton song, "Dirt Road." The covers that John and Phil chose for this record reflect astute choices and compliment John’s original songwriting efforts wonderfully. The tale of woe continues with "Brother, Can You Spare a Dime?" “Yes I’m down on my luck….hey buddy….can you spare a buck?” Life in the streets is tough and begging for everything from a dime to a buck is a tough way to survive. Fortunately, John’s attitude begins to change in the traditional "I Won’t Be Down." Even though he’s down for the moment he won’t be down for long….a better day is coming. "Seattle Rainy Day Blues" is probably my favorite song on the disc. "Another rainy day in Seattle….don’t believe I can stay here no more! Pack up my clothes sweet mama, I’m going to ride that midnight train….and wherever I move to it will be better than all of this rain!” John obviously is not a big fan of the weather in Seattle and it’s time to move on out. "The Blues Three Ways" is a live cut that includes the piano accompaniment of Daryl Davis, and is the closing song on the record. “Some people say the blues….the blues ain’t so bad…..but you know it’s the worst old feeling…that I’ve ever had!” Classic John Cephas and a wonderful way to close out this wonderful record. Listening to Shoulder to Shoulder is a wonderful reminder of an era of blues that has almost passed us by. The wonderful musicianship of John Cephas and Phil Wiggins reminds us that all forms of blues are important. And while the traditional stylings of Delta and Texas blues have long since gone electric, there is still beauty to be found in the handiwork of these Piedmont masters. 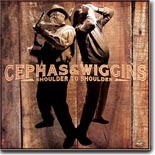 Enjoy this record and take the time to catch Cephas & Wiggins live if you can. Their almost 30 years of playing together is reflected in the seamless way Shoulder to Shoulder weaves its way through the wonderful original writings of John Cephas and the brilliant classics they’ve chosen to cover.